This project started to mature when I acquired two books written by Charles Boxer about Portuguese in the East and a monograph on Namban screens, as additional information for another story. Immediately the Namban byobu captivated my attention and I said to myself that one day (more than fifteen years later, in fact) I would have to use it in a story. The screens in question belong to the Museu Nacional de Arte Antiga in Lisboa. I will deal with the characters depicted in them and how I use it for the story. 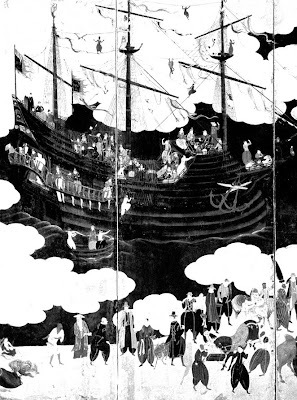 The Kurofune, or Black Ship, is one of the stars of the story and also one of the main subjects of the screens. I will deal with it in detail later on, but let us first see how the Japanese artist saw her. First of all, he had the extraordinary ability to show stem, stern and starboard simultaneously, thus providing us with plenty of information in one single picture. 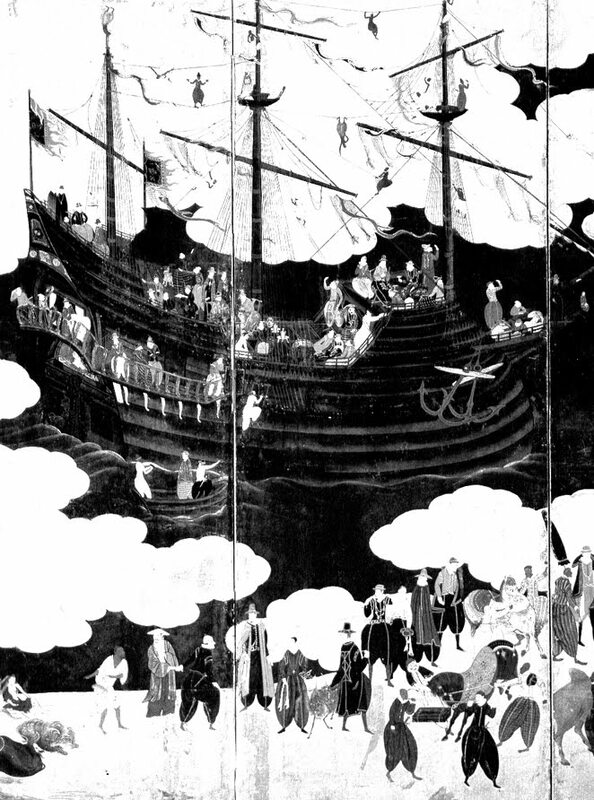 Since a great number of details in the screens proved to be accurate (later screens, when the ships were no more to visit Japan, were more fantasist) I have no reason to consider any information on them to be fortuitous. Probably some contemporary European paintings were less useful for naval history. 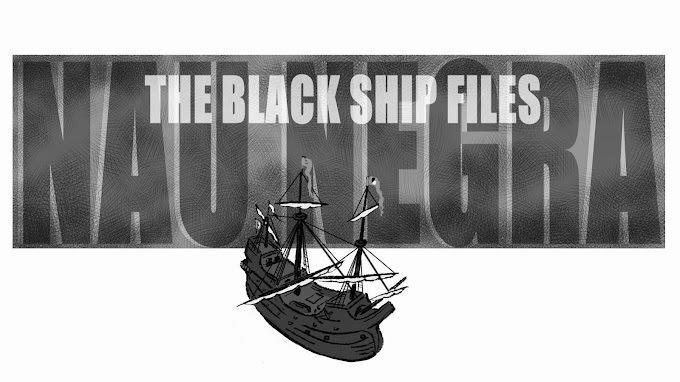 The Black Ship is indeed very dark, although not entirely black, and the artist took pains to show that. Portuguese ships of the time didn’t present painted hulls and were the color of the wood, so the Black Ship was most probably in various shades of dark brown. The ship looks like an old Portuguese Nau with some changes, mostly the shape of stem and stern, and curvature of the ribs, to fit new trends. We will go back to this on another post. The second thing that calls our attention (their purpose, after all) is the banners floating over the aft part of the ship. They don’t look European at all and you may suppose the artist, unable to understand the intricacies of European heraldry, decided to use the more familiar Chinese type. The Portuguese, despite their arrogance (only matched by the superior quality of the Dutch arrogance), were dealing with peoples that usually looked upon them as inferior, namely the Chinese and the Japanese, so commerce had to be done following the rules of the house. As Fernão Mendes Pinto notes in “Peregrinação”, what for an arriving European ship means war (noisy instruments, banners, canon shots), in the Orient means peace and good fortune, and they are essential for the costumer not to be suspicious of piracy or at least very bad manners. So the Chinese banners and streamers stay, in the story. Third, we may think that life on board was terrible. The barbarians that come out of it look noisy and restless, jumping, laughing and shouting incessantly at each other. The contrast of the enormous Black Ship with the golden luminosity of the beach is eloquent. Can you smell the sweat?